We are a family owned company passionate about creating natural, handcrafted cosmetics that are both gentle and good for you! Our products are made with high quality, nutrient rich ingredients, and are never tested on animals. We would love to share this journey of healthy skin care with you! "Made with love in the Blue Ridge Mountains." Courage Loose Mineral Eye shadow! True Red tinted lip balm!! Sunset Peach Tinted Lip Balm! 2 Tinted Lip Balm Gift Set! 3 Tinted Lip Balm Gift Set! Probably the most hydrating product I have used on my face. I have normal/dry skin and this balm stays on the face all day. Can be used as a primer under face powder (which is also awesome) or alone for a natural coverage. Also has sun protection (SPF). Wonderful product! A fresh batch of Poppy Tinted lip balm! I love this shade! It has more of a red tone on lighter skin tones and a deeper hot pink/cranberry shade on darker skin tones. Hope everyone is having a really sweet Saturday! A beautiful fresh batch of Honey Tinted Facebalm! This luxurious tinted moisturizer is a must have in your makeup/skincare routine! Tinted Facebalm gives you a youthful glow and keeps your skin feeling hydrated all day! Just poured a beautiful fresh batch of Cream Tinted Facebalm! I love this shade! If you wear our honey tinted face balm, Cream facebalm can also be applied as an under eye concealer! It's nourishing and gentle on the skin. 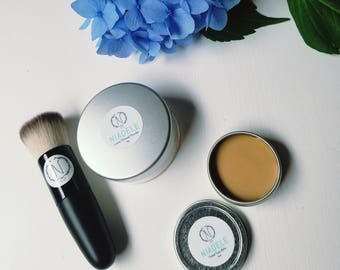 Luxurious, and nourishing tinted face balm! We would love to care for you and share the journey! Hi my name is Laura Kaufman! I love creating natural cosmetics with beautiful, nutrient rich ingredients! Our formulas are gentle and never tested on animals! We would love to take care of you! "Made with love in the blue ridge mountains." 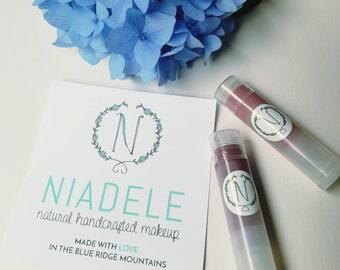 We custom make natural, handcrafted cosmetics with high quality ingredients that are gentle, hydrating and nourishing to the skin! Our products are custom tailored for sensitive skin; we don't use: talc, bysmuth oxychloride, mineral oil or parabens in our products. Our formulas are gentle, nutrient-rich and made with love for you! Mineral makeup performs beautifully when stored in a cool, dry place. Please show it a little love and keep it away from heat, humidity or light. Refunds or exchanges are accepted for product in original condition within the first two weeks of receipt. Products listed as Final Sale may not be returned. I love caring for my customers! If for any reason you are unhappy with a purchase, please message me directly so that we can work things out. I would so appreciate you talking to me directly instead of leaving negative feedback on my page. I want my customers to be happy so please contact me with any questions! All major credit cards through the Etsy system. I ship via USPS first class for all orders under 13oz and USPS Priority for any order over 13oz. I will send you a tracking number once the item has been shipped.